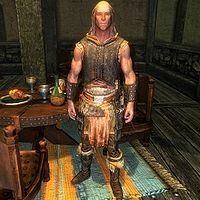 Belrand is a Nord spellsword and blade-for-hire who can be found in the Winking Skeever in Solitude. He charges a fee of 500 gold. He wears a set of iron armor, a pair of hide bracers, and a pair of hide boots. He is equipped with an iron sword. He knows the Alteration spell Oakflesh, the Conjuration spell Conjure Familiar, and the Restoration spells Fast Healing and Lesser Ward. Belrand can join the Blades, and can also be a potential marriage partner. He will glowingly advertise his services with: "Versatility is the key to survival. Hire me, and you'll be well prepared to face threats both magical and mundane. ", "I fight with both blade and spell. You might say I'm equipped to handle nearly any threat. So, shall we talk price? ", "Sure, you can hire a swordsman or a spellcaster to fight at your side, but why not get both for the price of one? ", "By blade or by spell, if you want it dead, I'll make it dead. All you need to do is pay my fee. ", and "The blade can be as lethal as the spell, but deadlier still is the one who wields both!" If you heed his endorsement and hire him, he will gleefully say: "What dangers and wonders shall we discover in the frozen wastes? I can hardly wait to find out!" And when told to follow, he will declare: "Onward to our next adventure!" However, when told to wait, he will say: "Very well. Just be careful!" And when told to leave, "If that's what you want. Watch your back out there, and if you need me again, you know where I'll be." If asked to trade items, he will jokingly say: "Do I get to keep it? Just kidding." After being hired, Belrand will occasionally greet you with: "You're looking hale and healthy. It's good to see you again. ", or "Didn't think I'd be seeing you again so soon." Like other hirelings, he may offer his services free of charge after being dismissed, with: "Back for more? Since we had so much fun the last time, I'll join you free of charge." If you accept, he will tell you: "Lead the way." He wears a heavy cuirass, despite being proficient in light armor instead. In addition, despite having a high Destruction skill and a perk for Destruction, he knows no Destruction spells. This issue has been addressed by version 3.0.8 of the Unofficial Skyrim Legendary Edition Patch; he is now fully clad in hide armor, and has the ability to cast Ice Spike. In the Creation Kit data, there's an outfit named 'BelrandOutfit', which consists of a leveled piece of light armor boots, cuirass, and gauntlets of the best quality. However, it isn't in use. He exhibits the mercenary followers bug as a stewardHF.